5.5 Mm - 7.1 Mm. 4.2 Kg/m2 - 6 Kg/m2. 0.5 Mm - 2 Mm. 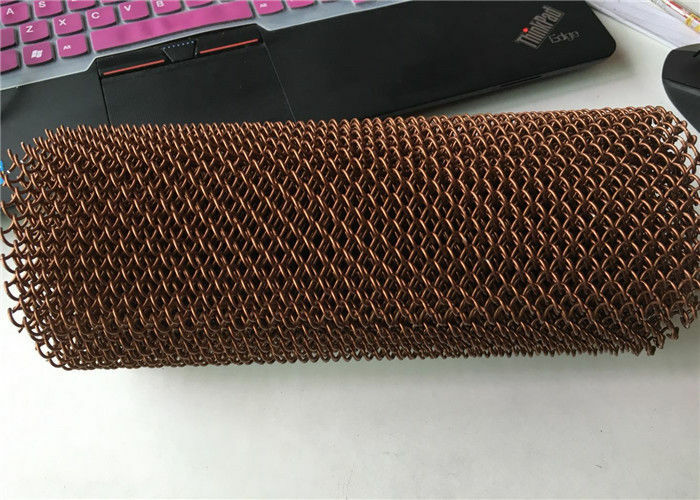 Metal coil drapery, also named as metal mesh curtain, is a kind of fashionable decorative metal fabric. It is widely used in the residences, hotels, concert halls and other places. Manufactured from high quality materials, metal coil drapery is woven into diamond meshes and then surface treated into various colors. Different from traditional curtains, the metal coil drapery can supply a modern decoration styles for residences, hotels and other high-class halls. Colors: white, silver, yellow, brown, black, red, purple, bronze, gray and so on. Note: other material and specs can be customized. First, metal coil drapery is packaged in rolls with water-proof paper or plastic film. Then put them in cartons, wooden cases or pallets at your requests. About the installations of the metal coil drapery, we have three methods. And stainless steel curtain rod is easy for metal coil curtains to install on. U track and H track are made from anodized aluminum material. Both are lightweight and rust resistance. These three curtain tracks all have strong steel support, free flowing gliders that can withstand all weights of metal mesh draperys.